Congratulations—you’re engaged! It may not feel real quite yet, but soon it will start to sink in that you’re on your way to getting married. Whether you were swept off your feet with an extravagant proposal or your partner sweetly popped the question in a more private way, it’s time to celebrate this exciting milestone in your lives together. Toast the soon-to-be bride and groom with custom engagement stationery and keepsakes from The Wedding Shop by Shutterfly. Our collection of save-the-dates, stationery, wedding party invitations and wedding keepsakes will help you celebrate your engagement in style. Whether you’re still reeling from the proposal or eager to start planning your wedding, you can find everything you need to bring each detail of your celebration to life, all in one place. The wedding date announcement is the one your friends and family have been waiting for. Once you’ve chosen the perfect day to have your wedding, let them know to mark their calendars with a memorable save-the-date. Find stylish card or magnet designs and personalize your favorite with photos that capture your personality as a couple. Whether you prefer a classic, elegant look or something rustic and chic, choose from our collection of curated themes to create a memorable announcement your loved ones will be thrilled to receive. Even though your wedding day is the Big Day, an engagement in itself is an occasion to celebrate. From the engagement party to the bridal shower to the bachelorette bash, there is no shortage of fun to be had before your wedding day finally arrives. 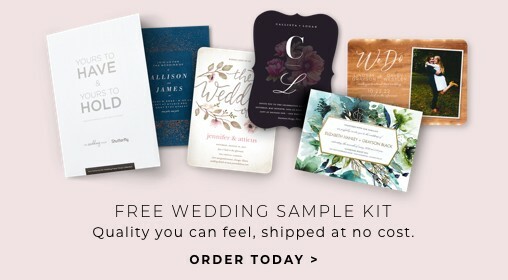 For each celebration along the way, The Wedding Shop is your source for custom party invitations that fit your style and bring your inspiration to life. Say “yes” to a vibrant or sophisticated design perfect for inviting your friends and family to the engagement party. Set the tone for the event with an invitation featuring an elegant portrait or a candid shot of the happy couple—or pick a non-photo option if you prefer. Choose a pretty bridal shower invitation that honors the bride-to-be, or a bachelorette party invitation that captures her fun side. 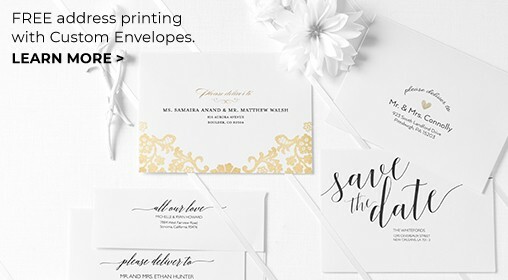 No matter the occasion, browse a variety of sizes and themes to get started and personalize your invitation cards down to every detail for a uniquely memorable, tailored look. With luxe cards and beautiful keepsakes from The Wedding Shop, your engagement celebrations are sure to delight. Top them off with stylish stationery and curated accessories that bring a professional touch. 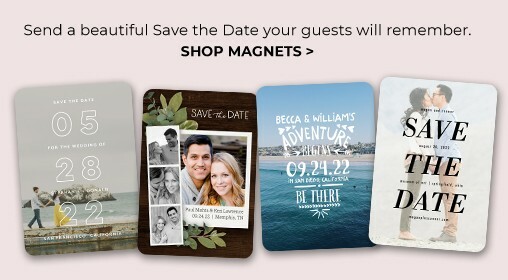 Choose from custom address labels and self-inking stamps to add style to your save-the-date and invitation envelopes. When the parties come to an end, show your gratitude for the love and well-wishes of your family and friends with coordinating thank you cards. Few things are as sweet as a marriage proposal. That mixture of shock, excitement, and euphoria is something you’ll never forget when you immortalize the moment with engagement photo keepsakes. Create a customized memento of your engagement—from the proposal until your wedding day—with a beautiful photo book. Or bring a touch of romance to your home and office with keepsake décor, including calendars and metallic art prints. Commemorate the carefree bliss of your engagement in your way with The Wedding Shop.